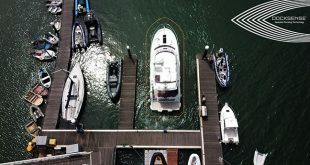 WILSONVILLE, OR (September 21, 2017) – One of the best ways to get the most out of any marine electronics is to update software when it becomes available. Make this a habit and you’re sure to stay on the cutting edge—all without any additional investment. Installing the new update is simple via wireless network or PC. For updating via wireless network, simply connect your Axiom to your home Wi-Fi or your phone’s mobile hotspot. 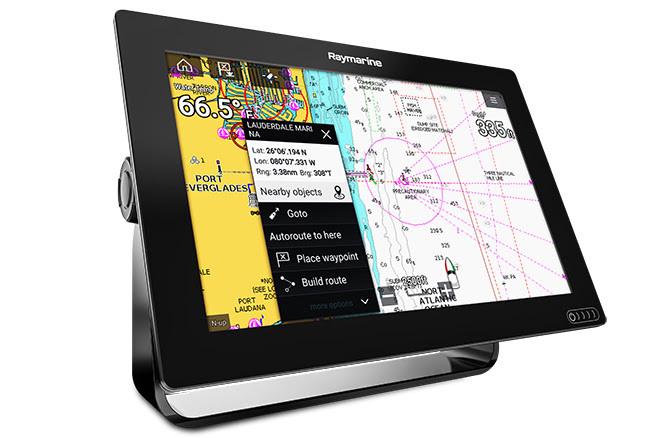 Yes, you can actually update your Axiom software while you’re on the water! 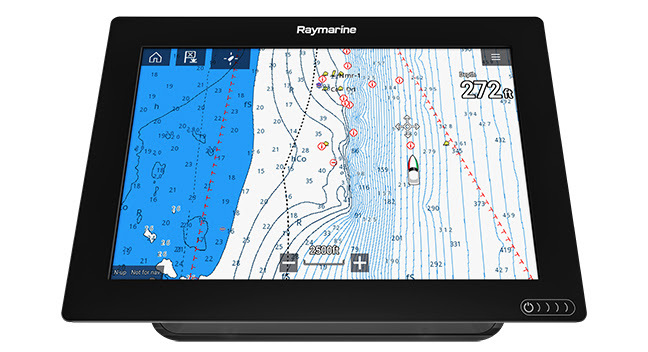 You can also download Lighthouse 3.2 via Raymarine’s website here. 3D Sonar GPS Track Mode: This is the new default operating mode for RealVision 3D. The 3D image responds in real-time to inputs from its internal gyro-stabilization, plus the GPS system. When you turn, you’ll see the 3D image turn as well. When you speed up, it matches your speed. When you stop, it stops. As you make multiple passes around the same area the 3D image continuously updates and gets larger. 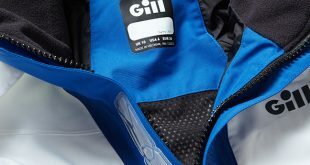 Adjacent passes are stitched together into a comprehensive view of the bottom, structure and water column. Fish and bait that were in one location on pass one and shown in their new location in pass two, three, four, etc. Depending on the depth where you are fishing, the system can display 10 minutes (or more) of prior history. 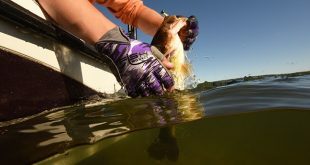 Deeper water gives you more time. Sonar Scroll Back: You can now pause and rewind any sonar channel on the system. If you’re looking at more than one sonar channel simultaneously, pausing one pauses them all and when rewound, they all rewind together. This lets you go back and take a second look, add waypoints, etc. Historical Sonar Sensitivity: If you adjust any of the sonar sensitivity settings (gain, filtering, etc. ), it not only applies to new data coming in, but also to all of that prior scroll-back history, too. For example, you might increase or decrease the surface filter or gain and suddenly see fish in your past history that were previously concealed. 3D Waypoint Placement: You can now touch anywhere on the 3D display and drop a waypoint. There is a mechanism there, too, that allows you to fine-tune that waypoint to get it right on the desired spot. 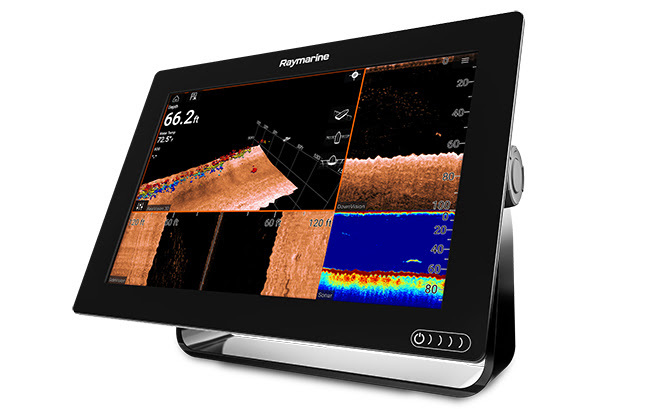 New SideVision and DownVision Default Settings: Raymarine sonar engineers have re-adjusted the default levels for target intensity and gain on SideVision and DownVision channels. These new settings offer increased clarity and definition without additional user adjustment.